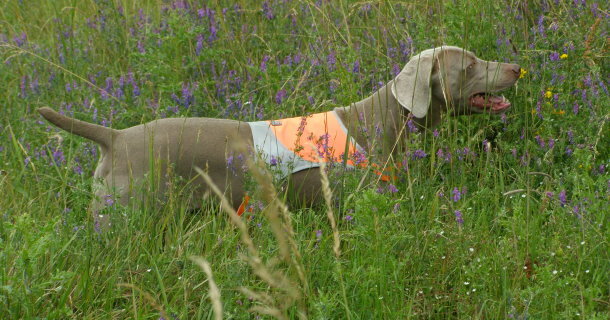 Welcome to huntingweimaraner.com, a resource for the owners and handlers of the Hunting and Working Weimaraner, principally in the UK but content may be of interest to owner-handlers of the hunting Weimaraner the world over. We hope to bring you news and information concerning the hunting weimaraner, and listings of field events such as field trials, gundog working tests and spring/grouse pointing tests as well as shot over and other training days and events. In the shooting season we hope to update you with field trial results where Weimaraners have competed. Recent posts are shown in the Latest Items section. More posts can be found in the Articles and other sections. And our feature item is an article narrating the history of the Weimaraner in UK Field Trials since the 1950s. Available from the top menu bar. The article also features two “Weimaraner All Time Field Awards” tables, by Dogs and by Owner-Handlers. Health Tested Weimaraner Litters may be advertised this website. Approved listings will then be shared onto to a companion Facebook Page to reach an expanded audience, and at no extra charge. You must register as a User to post an ad, and there is a small fee, and terms. You can also, within the ad, link to your website or even your Champdogs litter page. To post or view ads click the “Classified” menu option on the main menu bar. Click the Ebay menu link to bring up an array of field and gundog items from our affiliate partner, Warringahshire Field Sports. Click an item to purchase via Ebay. You are invited to make comment on the content and otherwise express your views and participate in discussions in the various forums. Some content first appeared on the Weimaraner World website.